The position has been filled. By our dog. Robbie, Justin, Barkley, and I went to the park for a family outing this afternoon. Justin and Robbie hit the playground while Barkley and I went for a run in the middle of a cross country meet. Barkley broke down a mile in and refused to go another step, so we headed back to the playground. As soon as Robbie saw Barkley, he flew down the slide and came running for his dog. And the two of them were off. Robbie grabbed the leash, and he and Barkley took off around the playground. Justin gave me one of those do-you-really-think-this-is-a-good-idea looks, and all I could do was shrug. And laugh, as Barkley pulled Robbie into the woods and through the mud. Oh, and as Barkley took off into a run, leaving Robbie sitting in the mud. Barkley circled back and waited, a cycle we saw the entire way around the pond and back to the cars. 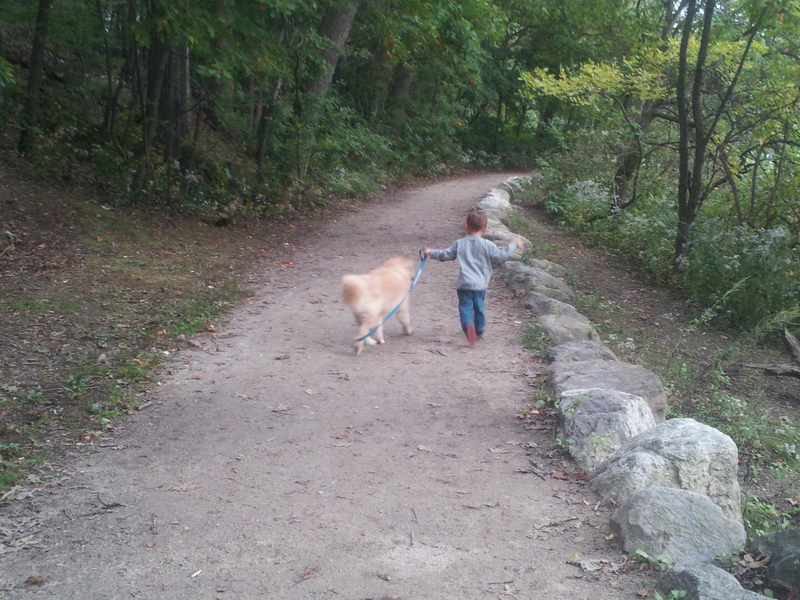 Every time a dog came into view, Barkley pulled Robbie along the path and Robbie tried to keep up. He hit the deck several times. Eventually, they came to a nice pace. And, as we walked around the pond, I reminded Justin of a walk we took in the same place with Barkley when I was pregnant. Justin told me then, hand on my belly, that he couldn’t wait to watch our son walk Barkley because he knew they would be best friends. And they are.